Well, our baby girl is officially a one year old! I love planning first birthday parties, mostly because I get to decide on the party theme and all the fun décor. As your kids get older, they form these things called "opinions" and want to have a say. So, take full advantage when you can when it comes to the party ideas! 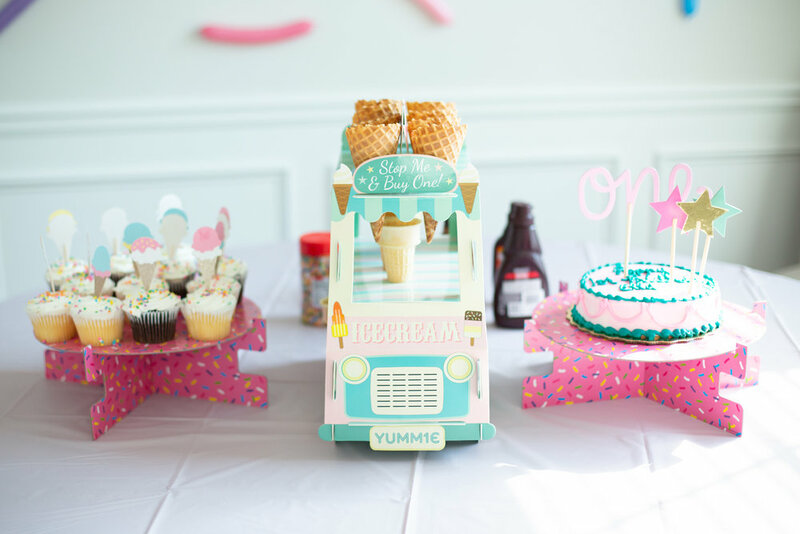 For Ella Jaye’s party, I decided on an ice cream theme so I could bring my sprinkle obsession to life. After some late-night pinning and some Amazon Prime ordering, because let’s face it…with two kids I did not have as much time to order the handmade stuff off Etsy in time for the party, we were all set. For our ice cream party, I created a sprinkle room with long, skinny balloons taped on the walls like giant sprinkles! The balloons were too long so I had to tie them off and cut them (kind of like sausages) to create smaller sprinkles. Each balloon made about three sprinkles. I got a super cute ice cream bar banner off Amazon to finish off the room. Pro tip: Make sure you have a balloon pump on hand, apparently you need one to blow up this type of balloon. I also found the cutest and affordable ($17.99) Ice Cream Truck dessert stand to use for the ice cream bar. The best part was how well made it was, now my oldest daughter can use it as a toy in her playroom. I bought gold balloons from Hobby Lobby to spell out “One” and “Ella.” While browsing through Target, I found a cute photo banner that displayed photos of Ella from 1-12 months old. For her first Birthday, we got Ella a pop-up ice cream truck, it was a big hit with all the kids (big and small). We filled the truck with balls that we had saved from Caroline's first birthday party - ball pits are always a hit! On Amazon, I found the cutest little ice cream cone shooters to use as party favors. We knew there would be older kids from our neighborhood at the party and wanted them to have something fun to take home. I was able to find sprinkle trays and some other sprinkle themed party items at local stores like Hobby Lobby and Target. I did order cupcake toppers and her birthday outfit on Etsy. When ordering on Etsy, I also use Ebates to save a percentage on my order. 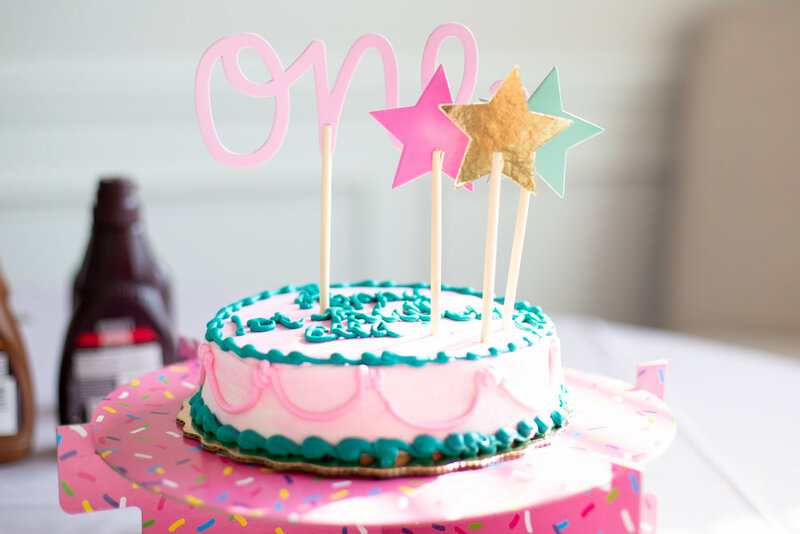 I was surprised to find a cute little "1" party hat and high chair skirt on Amazon. To be honest, I was pleasantly surprised at how many cute party items I found on Amazon. I think this is because more small vendors are distributing through Amazon these days. I love this because I can support smaller business but still have the convenience of my Prime membership. Parties are always stressful, but it is nice to be able to welcome family and friends into your home. We had a wonderful time celebrating our baby girl's first birthday and look forward to many more to come!